1º To compare the unemployment rate among all European countries. 2º To analyse the unemployment rate evolution from 2002 to 2012. 3º To identify the factors associated with high unemployment rates. 4º To develop an explanatory theory that associates unemployment rate with other indicators such as Growth Domestic Product (GDP). Camino, J. R. (2011). Cómo escribir y publicar una tesis doctoral. ESIC Editorial. Saunders, Mark NK, et al. Research methods for business students , 5/e. Pearson Education India, 2011. Pearson. 1º Identify what scope or organization your research involves. After identifying a sub-branch or area of knowledge you should choose an organization or scope you want to research on. Following the example given in the previous post about the microeconomic sub-branch “unemployment”, you might be interested in the unemployment in the European Union, or in the European Union and China. Maybe you just want to research on your city or region. 2º Formulate a general focus research question. The research question is likely to change over the rest of the research process but now you just need to formulate the question that flows from your research idea. Generally, these questions are headed by an interrogative particle such as what, why or how. Choosing one or another is not trivial. The questions headed by what like “what has been the evolution of unemployment in the European Union over last decade?” are usually descriptive researches as they consist of a description of a number of collected data. Some authors like Philip and Pugh (2005) refrain from consider descriptive research (called by them “intelligence gathering”) as properly research although it may form part of your research project. Actually, the answer of this question is commonly the first step in the research process. What Philip and Pugh consider research properly is usually headed by the particle “why” (also how). An example of this second question would be: “why do European northern countries register a lower unemployment rate than southern countries?” These questions go beyond descriptive research and require analysis or, in other words, they look for “explanations, relationships, comparisons, predictions, generalizations”. Therefore, the why question part of your research could lead you to work at the theoretical level (you can visit this link to understand what exactly mean theoretical level. What has been the unemployment rate in European Union throughout the last decade? Why have northern European countries registered lower unemployment rate than southern countries? 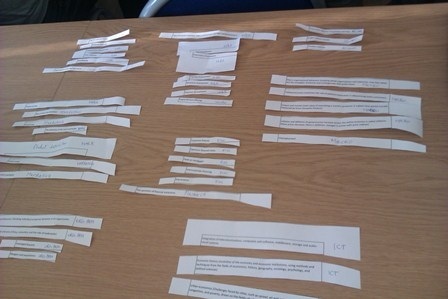 How to design a qualitative research? Try to classify your research idea first into its discipline (Management or related ones), then its branch (let´s say human resources) and finally the precise aspect or sub-branch in which you are interested. Let´s say recruitment. This process was termed as “working up and narrowing down” by Jankowicz (2005:34-6) The Russian dolls illustrate it very well. Every doll is supposed to fit into the following bigger one as well as your idea into a more general area of knowledge. In this metaphor your idea is going to be the smallest one. 1. As a way to find a research idea. Perhaps you don´t have even any research idea, but at least you know that you have more preference for, let´s say economic discipline, so that you start reading some general journal on economics. Among all branches you identify within economics you find microeconomic the most interesting and, more specifically, unemployment. Your idea of research could well be “Unemployment in Europe”, here your idea goes! 2. To take a clear direction. 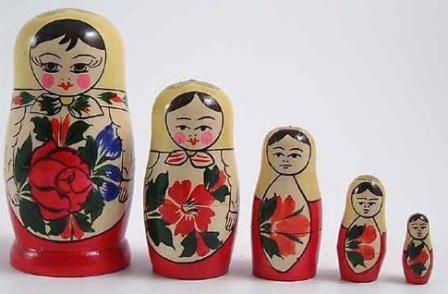 The “russian doll process” or “working up and narrowing down” may be reversed. It is, from the most specific one to the most general. Imaging that you have clear you research idea. For example, and continuing with the previous example, imaging that you have clear that you want to research on “Unemployment in Europe” but you haven´t even think over which branch or discipline it drops into. So you must try to identify the immediate more general brach in which unemployment is included. As you can see in the material provided unemployment fits into microeconomic and more generally into economic, which is one of the branch of management science. This process is crucial if you want your research to take a clear direction and, on top of that, to make easier the literature revision and data collection. Searching literature using the keyword “unemployment” in Google, finding relevant information is going to be as difficult as looking for a needle in a haystack. But if you identify the discipline, in our example, economic, you may do a more effective search in a journal dealing with this specific branch, for example European Economic Review. Once in the journal, you can find interesting articles and papers searching by the keyword “unemployment”. 3. To match your idea with your career goals or the field you are more interested. Finally, integrating your research idea will help you to visualize whether it matches you career goals. In other words, if you want to focus your career in the management branch of finance, you should consider find a research idea that belongs to this branch (see What is a good research) Among other reasons, making a research according to your career, will contribute greatly to your specialization, which is a more and more important factor when looking for job today. And for sure, having a publication on your field of especialty will make you different among any other candidate in a recruitment process, specially when it is published in a recognised journal. Camino, J. R. (2011). Cómo escribir y publicar una tesis doctoral ESIC Editorial. 1º What are your strengths and interest?. Think in previous subjects throughout your graduate. Is there any subject in which your grades have pointed out? Which one have you enjoyed most? Have you ever performed a remarkable work on a specific discipline or academic area? 2º Have you checked previous years research titles? Get inspired by previous years works. Ask your professor or supervisor for them. 3º Have you discussed your ideas with somebody? Remember how “post-it office” product was invented. The interaction with workmates was a key point. Get rid of your fears and shame and talk friends and classmates. It will be helpful to shape your idea and make it feasible. On top of that, in today´s social network society there are many professional and academic networks where you will find people willing to test your ideas. 4º Have you done a preliminary literature search? After discussing with mates, professor or in forum, you might also be suggested relevant literature. You can also have a look to some of the practitioner or academic journals such as the ones you can find in the right-side column. Look up possible books or reports in your library database. Review articles are of special interest for you since they usually contain a considered review of the state of knowledge in a particular area and suggestions of further research needs. One of them could be undertaken by you. On the other hand, books might not be up to date but by contrast offer a good overview of research that has been undertaken so far. 8º Brainstorming and relevance trees. It is best brainstorming with a group of people, although you can do it on your own. According to Moody (1988), you should first define your problem or sort of idea you are interested in and subsequently, ask for suggestions, relating to the problem. Castells, M. (1996). The rise of the network society (Vol. 1, No. 996, pp. 1-25). Oxford: Blackwell Publishers. Moody, Paul E. Decision making: Proven methods for better decisions. New York: McGraw-Hill, 1983. 1º Does it meet your institution requirements? Be sure of identifying your institution´s assessment criteria. You might develop a great research in the eyes of some journal or different institution, but if you really want to graduate or obtain a good grade, following your supervisor requirement might be crucial. For instance, some of them could emphasize the need of major theory framework, while others a more pragmatic approach. Though in many cases, the decision lies on the own students. 2º Is it linked to theory? In future posts we will emphasize the importance of linking your research to theory. So far, just take into account that regardless you are thinking of a more low-theoretical relevance research, a minimum theory makes the difference, but mainly because will allow you to meet the requirement that derives from the next question. 3º Does it provide fresh insights into the topic? In other words, to what extent your research provides new knowledge into your research topic. For this reason, having knowledge of the existing theory is crucial to know in what you may contribute. 4º Is the topic clearly stated? The research question and objectives must be formulated clearly, explaining, at the same time, which exactly insights your research contribute in. 5º Does it match you career goals? Doing your own research is doubtless a great opportunity to develop your particular area of interest, academic branch or industry sector or, in case you don´t even have it, a chance to find it. 7º Is doable in the available time? Assure that your project is doable within the time provided by your instructor. 8º Is realistic in financial terms? As student, and unless you are provided with a considerable amount of funds, such methods as telephone survey are unaffordable while others like interviews or secondary data might be more appropriate. 9º Do you own the skills to do it? Or would you be able to acquire such skills in the time allowed by the course of study? It is desirable that you develop as many skills as you can throughout the course. However, be aware that some skills like those related to languages or very sophisticated software could be out of your capability in a short term. 10º Do you have access to data? It is likely to be the reason that makes many researchers reformulates some of the research objective throughout the research process. Not always the information required exists or has public access. Try to make a previous assessment of the access to data when formulating your research topic. There are four things all researcher must bear in mind when formulating a research topic. 1º Being open to find unexpected things. In the 1960s 3M research scientist, Spence Silver, was trying to enhance the adhesive used in tapes. However, he discovered something quite different, since the resulting adhesive was not enough strong to stick tapes. Throughout the next five years he talked about his new adhesive to people working in the company. Later, a new 3M researcher was frustrated by how the scraps of paper he used as bookmarks kept falling out of his church choir hymn book and he realised that Silver´s invention could be a solution. Soon, after the concept was developed and market research undertaken, the wildly used office product Post-it was launched in 1980. Nowadays, it is rather difficult not find it in any office. As well as in this case, the results of your research might not match the initial objective, so that be open to unexpected things. 2º Discussing your idea with others. A success factor in the Silver´s invention was the fact of having talked about to people working in the company, what highlight the importance that interaction with others has in the research process. It is quite common that students do not talk openly about their research ideas. Sometimes for fear the ideas to be plagiarized, but in most of cases just for fear to make a fool of oneself. Both sentiments must be overcome and all researches, both veterans and beginners should have a few good friends willing to listen their ideas. This is actually crucial. Far from feeling shame of your ideas, a good critic might be crucial to make research ideas and topics consistent from the beginning of the research process. On top of that, in the rise of the so called network society (Manuel Castell, 2005) the transnational research groups are emerging from a wild range of academic and professional networks. It is very recommendable to take part of the existing debates in your interest field in such group or forum. You could also test the feasibility of your research idea. It will surprise you to what extent anonymous people are willing to devote you part of their time. “I don´t much care where”, said Alice. Castells, M. (1996). The rise of the network society Blackwell Publishers Oxford. Punset, E. (2007). The happiness trip Chelsea Green Publishing. How to distinguish between a true research & bogus research? What things make management and business research different? For a better understanding we have applied these questions on a example of a research under the title of” “What people really think about public smoking?” As long as a tobacco association is behind this report we should at least be prudent when sourcing the data provided. Secondly, assuming that “systematically” means using a method and providing appropriate details on it, as well as not having biased the answer, we finally considered it as a non-systematic research, since just a few lines were devoted to explain the method used and on top of that the questionnaire is not provided. Despite it could be a bogus research, we should admit that it has a clear purpose, which is clearly visible in the title, it is, explains what people think about some particular issue, in this case, public smoking. Hopefully, your research will have a so clear purpose too. Although instead of explaining you could prefer comparing, criticizing or analysing, among other purposes. Moving on the next point, it is also crucial to know the different types of research because it is probably going to be one of your first choices. Apart from the different types we have according to the discipline you are involved in, for example, economic, sociology, management (this is yours), or political sciences; the most elemental difference is between Pure or basic and applied research. A research under the title “How to increase effectiveness of small business“, basic or applied? What about “Apple´s Ipod sales have decreased 20% last year. What is the reason for this decrease?” There are many differences between both, but probably the most relevant is regarding its application. The basic one aims to produce new knowledge, regardless whether it is useful in a short term, while applied one usually aims solving problems of particular organizations. Coming back to our example, basic or applied? Great, you got it. But, wait a second, what is a organization. Ok, Apple is one, Toyota another one. Yes sure, Google too. But those are just one type of organization. What about a university, a school, cultural association, government, family? Yes, why not. Our class? Yes, although we have just met. In management world there is a tendency to consider organization as a company, but organization may be many things, it is just about a group of people sharing rules and roles. Here we have another important question for you research, which organization is your research about? Coming back to the basic/applied point. It seems that most of you prefer applied. So you are probably one of those that wonder “what is theory (basic) research for”, “is it really useful” Before Edison invented the bulb, he had likely been asked these questions too. Perhaps some friend of him could have suggested that “why do you want to invent a new way to illuminate our houses when we already have candles” He was actually right, but could you imaging lead our lesson without electric light? In other words, although basic research findings might not have an immediate application, it could become, in a long term, essential. Therefore, a research under the title “How to increase effectiveness of small business” might not be useful for your neighbourhood bakery, but it could definitively change this industry in the future. However, such as many authors suggest, although there are important difference between basic and applied research, it doesn´t mean that they are in conflict. In other words, it is about a basic-applied continuum rather that a categorical. It means that in a scale from 1 to 10, where “1” means completely basic and “10” completely applied, your research project might lay on 5. In 2001, Hodgkinson e t al, wanted to go further and suggest taxonomy for considering the relevance of a research, resulting in four quadrants. When a research is relevant in terms of theory and methodology and at the same time it is relevant in a practical meaning (it is applied) it is called pragmatic sciences. In the contrary situation would be puerile science (see “for beginners”). 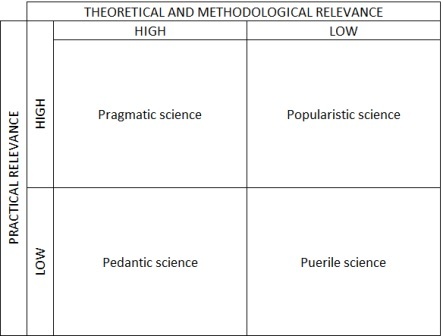 When the research has high theoretical and methodological relevance but low practical relevance, it is considered as pedantic science (in Spanish, “pedante”, in Italian “pedante” and in Chinese 迂) while populist sciences present the opposite characteristics, low practical relevance and high theoretical relevance. As bachelor students, which quadrant you belong to? Probably to puerile one, right? And struggling to be in populist. This is your challenge, isn´t it? Moving on to the third point of our second week lesson, there are three things that make management and business research (M&B research) different and that you should take into account for you project. First it is its tansdisciplinary character. What does it mean? Despite many authors put into consideration whether Management is a science or not, the true is that it usually takes knowledge from many other discipline which is, at the same time, an advantage, provided that this provide many insights. Thinking over your own research, don´t discard draw up other disciplines like economic or sociology when looking for information. On the other hand, management research is usually much related to decision making. It is very often crucial for successful manager´s decisions. Although many managers still base their decisions on personal experience (Rousseau, 2006), the truth is that in a more and more complex society and organizations, research-based decision making turn out to be essential. And there are many successful cases which are proving it and encouraging other organizations to adopt this strategy. As the one that came out in the movie Moneyball that changed the rules of baseball management. See bellow the official movie trailer. Last but not least, B&B research must have relatively high practical relevance, i.e., in a basic-applied continuum, it should lay closer to applied, which doesn´t mean that you can rid of the theory, which is actually an essential factor when researching. Finally, we went also over the research process and, concretely, over research stages, which actually matches with the chapters of our textbook and hence with our next lessons. Here is the result of activity completed by you ranking the different stages. Taking for granted that you wish to do research (at least to pass this course), in the next lecture we will go over the second stage which deals with how to formulate and clarify your research topic. Until then you can start reading my personal blog post on how to find a dissertation topic.